For more than 25 years, Ed Woodham has been active in community art, education, and civic interventions, across a variety of media and cultural contexts. An accomplished visual and performance artist, puppeteer, and curator, Woodham draws on a diverse range of influences from Fluxus and Situationism to Jane Jacobs, John Cage, and Gordon Matta-Clark. He employs humor, irony, subtle detournement, and a striking visual style in order to encourage greater consideration of–and provoke deeper critical engagement with–the urban environment. Woodham created Art in Odd Places (AiOP) to present visual and performance art to reclaim public spaces in New York City and beyond. AiOP has stretched the boundaries of communication in the public realm by presenting artworks, in all disciplines, outside the traditional venues of galleries, museums and theaters. Art in Odd Places has been produced in Los Angeles CA, Boston MA, Indianapolis IN, Greensboro NC in the U.S. ; Saint Petersburg, Russia, on Sydneyʼs Northern Beach communities of Dee Why & Manly, Australia. AiOP was selected as a representative in the U.S. Pavilion, Spontaneous Interventions:Design Actions for the Common Good at the Venice Architecture Biennale in 2012. 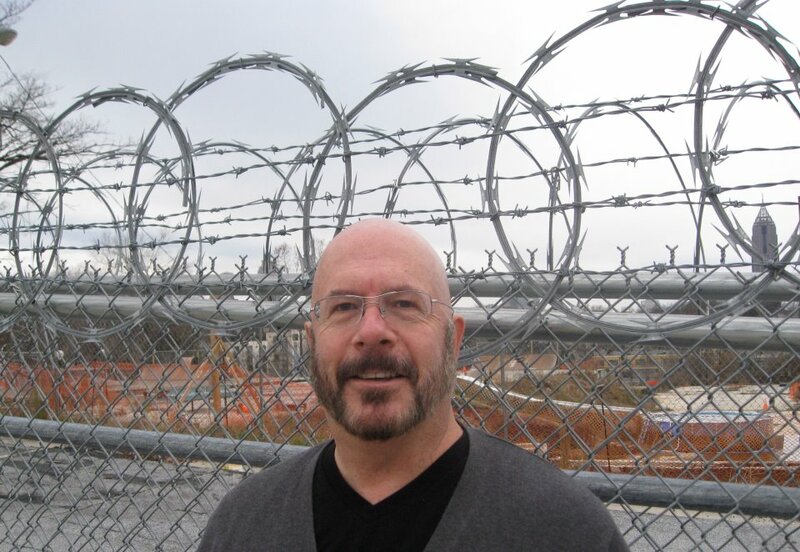 As founder and director of the arts collective 800 East in Atlanta Georgia (1990-98), he brought an artistic perspective to civic engagement, turning a derelict post-industrial space into a community arts center, reviving and sustaining both an artistic collective and the local neighborhood in the process. 800 East served as a base of operations not only for a living, studio, gallery, and performance space for local artists and monthly community art shows, but as a nexus for visiting artists and a base of operations for a series of factory shows and urban interventions. Woodham is a member of the faculty at School of Visual Arts in NYC for City as Site: Public Art as Social Intervention and a member of the faculty of New York Universityʼs Hemispheric Institute for EMERGENYC teaching workshops in politically based public performances. He was a 2012-2013 Blade of Grass Fellow in Social Engagement. For summer 2014, Ed was selected for the drawing(shed) residency to create a collaborative performance work with the residents of two housing estates in Walthamstow, East London. Check out his recent TEDxGowanus talk: here.